Next, I impatiently counted down the days until February 9 at 8:00 pm. Earlier in the evening I asked my Instagram followers to help me choose an outfit that would make me stand out so that I could get called on (see photo). I decided to throw in a bold red lip as well. I took an Uber because I can't stand driving or parking downtown. But I didn't allow enough time for downtown traffic (I forgot that post-game in Knoxville means PEOPLE EVERYWHERE) and we sat on Gay street, two blocks away from the Tennessee Theatre, for what seemed like forever. I finally got out of the car at 7:53 pm. After they checked my bag, ran the metal detecting wand over me, and scanned my ticket, I finally got in. The first two ushers I encountered were helping other people but it worked out perfectly because the third one was a friend of mine (Hi, Zach!). He showed me to my seat--they had created three sections of seats in the Pit and I was on the left end of the middle section. I sat down and the woman next to me pointed out that a stage monitor was directly in front of me. I thought she was concerned about sound, so I explained that the sound would be going toward the performers because it was a monitor and not a speaker. Turns out she was worried about my not being able to see! There was an open seat next to her husband and she said that, if no one showed up, they'd move down so I could move one over. How sweet! No one showed up, so she moved to the empty seat and I sat next to her hubby. 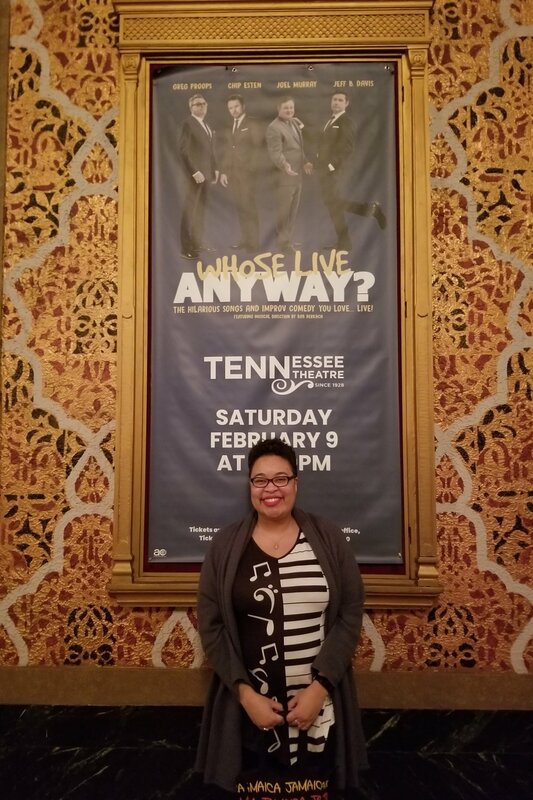 I always meet such kind people when I go to the Tennessee and the Bijou. The show started a little late, then Greg Proops came out and warmed up the crowd. He then introduced the rest of the gang (Joel Murray, Charles [Chip] Esten, and Dave Foley [standing in for Jeff B. Davis]) and the bandleader (who was celebrating his birthday). Then they jumped into their first game and Greg asked people in the audience for an action for Chip to perform. And guess who he came to first? The woman with the crazy shirt, of course! I. Totally. Froze. Suddenly I couldn't think of anything. What's an action? What are words? OMG THEY'RE ALL LOOKING AT ME. I wanted them to call on me and when they did, AT THE VERY BEGINNING OF THE SHOW, I froze like T'Challa in the jungle. I even went through random words in my head on the ride there in case they called on me... I turned to the couple next to me and asked for their help but they were coming up empty as well. So I said "Teaching!" Greg was like Are you serious? (not in a mean way!) Then he went to the other side of the stage to get an action for Dave. That person's suggestion was sitting. So they needed two actions and they got teaching and sitting. Welcome to Knoxville, boys! They did the best they could with our lame suggestions and were hilarious, of course. Several other games were played, but that's not why I'm departing from this blog's regular material and telling you about this non-introduction to music related topic. I am here to tell you that I GOT A CHANCE AT REDEMPTION. They'd asked for volunteers multiple times and I chickened out. But later in the show, Dave Foley asked for some and I said to myself "Do it. This is why you're here on the front row." So I raised my hand and hollered. Dave smiled at me and welcomed me on stage. I didn't even know what the game was but I didn't care. I got up on stage and Chip (my fave, in case you missed that earlier) told me to turn sideways. I didn't know which way sideways was so he lightly maneuvered me so I was facing the audience and proceeded to air play the keys on the left side of my shirt. Somehow I didn't die right then and there... I think at that point Chip got a mic from Dave then shook my hand, asked me my name, and gave me the mic. The game was Sound Effects. For those unfamiliar with Whose Line, two cast members act out a story; they do all the dialogue but the volunteers have to provide all the sound effects. I was dying inside, especially when they did a practice run and I was laughing so hard that I couldn't follow along. Chip kept smiling at me and saying "You can't laugh now!" I didn't know if he was serious or not so I tried my best to contain myself. It was so difficult because the other woman was as bad at this as I was! At the end there was supposed to be gun shot. I was so busy laughing that Chip just kept making the shooting motion over and over and I'm stage right, doubled over, dying laughing! After the practice run, Chip gave me a hug for encouragement (or the hug might've been earlier; it's all a blur) and we did the real thing. Chip and Greg were construction workers, so we had to make noises like a work whistle (I stink at whistling so Chip said "the whistle must be broken"), jackhammer, saw, etc. It. Was. Hilarious. Then Chip said "I'm gonna pull up my Spotify.” Oh boy, I thought. This is perfect. “You know who I really like?” Oh no, please pick someone I know, Chip. “Whitney Houston." YAS. This was my moment, you guys. I steeled myself, dramatically threw one arm out, and belted "AND IIIIIIIIIIIIIIIIIIIIIIIIIIIIIIIIIIIIIIIII-EE-IIIIIIIII..." The guys were totally taken aback and the audience erupted with applause. *aaaaaand scene* Chip gave me a huge smile as he walked over, took the mic, and said to me "And I will always love you." He hugged me again, I turned and shook Dave Foley's hand (I'm sure I looked like a deer caught in headlights), and walked off stage. Several people congratulated me as I walked back to my seat, and I got a couple of high fives. There were a few moments during the sketch where I wanted to motion to my new friends (the couple I was seated next to) and ask them to take pictures. I'm glad I didn't, because I mentioned it to them afterward and they said they probably would've gotten in trouble, otherwise they would've taken a ton of pics. The wife said they asked twice to make sure and were told no photography or recording of any kind, and that it was the casts' policy. I'm sure glad I didn't get in trouble cuz I totally took a few pictures--I read all the info that the Theatre sent and it said no flash photography or video recording. Then they said that again as an announcement before the show began. To me, that means you can take photos with no flash. Oh, well. I’ll always have the memories! Anyway, the rest of the show was great (duh). The second best part--I did mention that I got TWO hugs from Chip, right?--was how many people came up to me afterward and said how great I was. Like, a LOT of people. Some complimented my overall performance while others specifically complimented my singing chops. One guy asked me if I was giving autographs! Then when my Uber showed up I was chatting with two other women and I didn't wanna cut them off even though I knew I shouldn't keep my driver waiting. An older gentleman went to the car and the driver told him my name. The man then called out "Robyn?" I said that was me and he went "Ah, she was the star of the show!" I was on cloud 9,999. So there you have it: that was my amazing evening. All because I bought a front row ticket on a whim, as a treat to myself. I thought about walking around downtown afterward (I bought new walking shoes today) and maybe getting a bite to eat. But my head was buzzing and, although I was super excited at the moment, I knew that I'd crash soon. I'd rather do that in the comfort of my home. Plus I didn't need to spend any more money!!! I hope you enjoyed this as much as I enjoyed writing (and living) it. Now back to concerts! Thanks for reading!